The Argan tree is a well adapted to drought and the harsh conditions of Morocco. 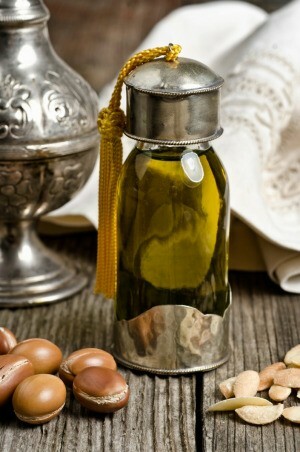 Argan oil is used for both food and cosmetics. This is a guide about using argan oil. I recently started using Argan oil on my face, and really like the results. It comes in a bottle with a dropper, which is fine, but makes for some waste. If my hands are dry, the oil kind of disappears before making it to my face! My solution was to buy a roller bottle on Ebay (I have also seen them on Amazon) and fill it with my Argan oil. Now, I just run the roller on clean face and then massage in with my fingers. The oil goes much further, and there is little chance of spilling. 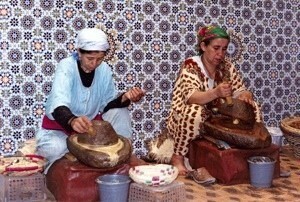 Argan oil is produced in Morocco by Berber women. In recent years this oil has been discovered by western cosmetic companies which praise this oil for its skin benefits. Traditionally this oil has only been used in the region of Morocco it is produced. This oil is high in vitamin E. Green in color, the tree kernels or nuts appear similar to, but larger, than olives. It has a smoky, nutty flavor which is great drizzled over pasta or salads. It is also used on hair, nails and skin. Argan oil has smoky, nutty flavor which lends it self to a great addition drizzled over pasta. Used to make Amlou, sweet almond concoction which contains argan oil, almond paste, and sometimes honey, which tastes great on toast. In recent years this oil has become popular among westerners, especially cosmetic companies who have started using this oil in their facial products. The oil is traditionally extracted by cracking the nut between two big rocks, the seeds are removed and lightly roasted then mixed with a dough which is squeezed to extract the oil. This method is still the most common method. For export, the oil is extracted mechanically. Will keep 3-6 months if prepared the traditional way of extracting the oil by hand. If extracted by dry pressing, the oil will keep for 12-18 months. Substitute for olive oil. Argan oil puts a twist on your traditionally olive oil pasta dish. The Argan tree is a well adapted to drought and harsh environmental conditions.